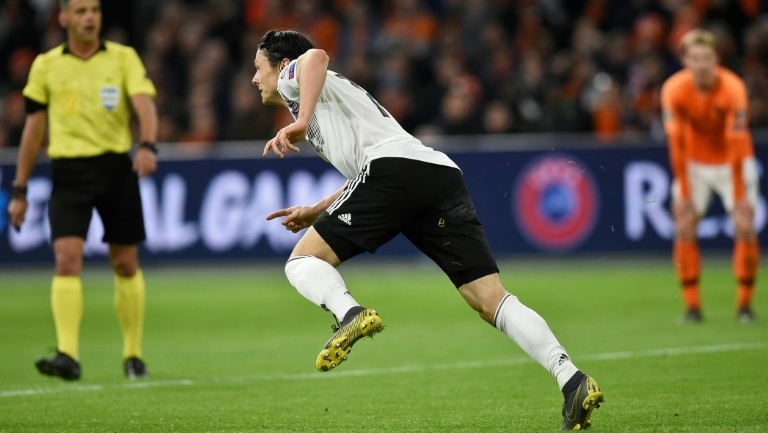 AMSTERDAM: Germany’s Nico Schulz sealed a thrilling 3-2 win over the Netherlands in a see-saw Euro 2020 qualifier as Joachim Loew’s new-look line-up survived a severe test on Sunday (Mar 24). A revamped Germany raced into a 2-0 lead in Amsterdam with thrilling strikes from Leroy Sane and Serge Gnabry but the hosts struck back with a second-half header from Matthijs De Ligt before Memphis Depay pounced for an equaliser on 63 minutes. The win comes after Loew took an axe to Germany’s squad ahead of the qualifying campaign in the aftermath of last year’s calamitous World Cup elimination when he told Bayern Munich trio Thomas Mueller, Jerome Boateng and Mats Hummels they had no future in the national side. Dutch keeper Jasper Cillesen was left with little chance after Gnabry ended his mazy run by outwitting Virgil Van Dijk before sending a rasping long-range effort into the bottom corner in the early action. Ballon d’Or winner Luka Modric was powerless to stop beaten World Cup finalists Croatia from slipping to a 2-1 defeat to Hungary in Group E on Sunday as Mate Patkai notched a 76th-minute winner in Budapest. England eased past Czech Republic as Manchester City’s Raheem Sterling scored a hat trick in their 5-0 win at Wembley Stadium on Saturday.